VANCOUVER, WA--(Marketwired - Mar 24, 2014) - CRU, the leader in storage solutions for digital cinema (DC) content distribution, announces the availability of its new DCP Kits, convenient all-in-one solutions for DCP distribution. "We're pleased to bring the DCP Kits to the digital cinema market to supplement the storage solutions we've been offering digital cinema distributors for several years," said Randal Barber, President and CEO of CRU. 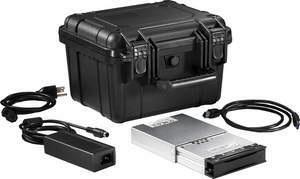 The DCP Kits include a robust waterproof and dustproof shipping case that has been drop-tested extensively and includes custom foam for maximum protection of its contents as they are shipped to movie theaters around the world. "We expect the DCP Kits to be a very successful offering," said Keith Schimmenti, CRU Sales Director, Digital Cinema. "Early demand has already shown that these are being well-received." CRU's DCP Kits can be ordered with or without pre-formatted EXT3 disk drives (ISDCF specification). The kits are available in two versions, both of which include the industry-standard DX115 DC Carrier and the shipping case. Customers can also opt to include the USB 3.0 version of the popular DX115 MoveDock, complete with USB 3.0 cable and power supply. With either DCP Kit, content distributors have a complete, convenient package for transporting digital media. CRU will be showing its DC storage and shipping solutions, including the DCP kits, at CinemaCon (booth 2815A), March 24-27, 2014 at Caesars Palace in Las Vegas. For more product information, see http://www.cru-inc.com/digital-cinema, or contact Keith Schimmenti at +1-360-816-1791. Founded in 1986, CRU® is a pioneer in data security, encryption and data mobility devices. The company's flagship DataPort®, along with the Data Express®, DataHarbor®, CRU RTX®, RAX®, ToughTech® and WiebeTech® product lines of removable and external hard drive enclosures are the de facto global standard for physical data security and safe data transporting in government, education, audio/video production, digital cinema and business markets. CRU Inc.'s new Digital Cinema Package Kits can be ordered with or without pre-formatted EXT3 disk drives (ISDCF specification). Two versions are available and include the industry-standard DX115 DC Carrier and the shipping case. Digital cinema distributors can also opt to include the USB 3.0 version of the popular DX115 MoveDock, complete with USB 3.0 cable and power supply.